Stunning. Pun intended. Alderman has woven a narrative that creeps eerily over the history of a radically changed society. As women all across the world come suddenly, and tumultuously, into the ability to disperse a volatile charge unto captors, offenders, lovers, and victims alike, the fundamental schema of society is irrevocable altered. Through the lens of warriors and watchers experiencing and shaping the upheaval first hand, Alderman holds a mirror up to the influence of power of any kind, for better or worse. With writing as compelling and electric as it's characters, The Power is a must read, equal parts far away and unfathomable, and provocatively, astonishingly present. 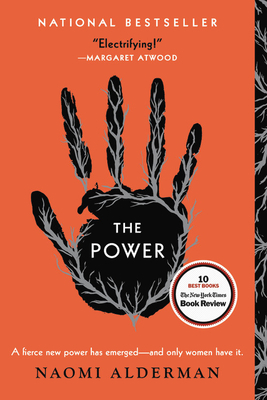 Ambitious and provocative, visceral and page-turning, award-winning author Naomi Alderman's THE POWER at once takes us on a journey to an alternate reality and exposes our own world in bold and surprising ways. Naomi Alderman is the recipient of the 2017 Baileys Women's Prize for Fiction for The Power. She is also the author of The Liars' Gospel and Disobedience, which won the Orange Prize for New Writers, has been published in ten languages, and has been made into a film by Rachel Weisz. Alderman was selected for Granta's once-a-decade list of Best of Young British Novelists and was chosen by Margaret Atwood as part of the Rolex Mentor and Protégé Arts Initiative. She is the cocreator and lead writer of the bestselling smartphone audio adventure app Zombies, Run! She contributes regularly to The Guardian and presents Science Stories on BBC Radio 4. She lives in London. "Electrifying! Shocking! Will knock your socks off! Then you'll think twice, about everything." "An instant classic of speculative fiction... Smart, readable and joyously achieved." "The Power is stupendous. It's gorgeously written, endlessly exciting, fun, and frightening." "The Hunger Games crossed with The Handmaid's Tale." "What starts out as a fantasy of female empowerment deepens and darkens into an interrogation of power itself, its uses and abuses and what it does to the people who have it... Alderman's breakout work." "Please, please, PLEASE read Naomi Alderman's The Power. It'll crack your brain open in all the right ways. Such an important, timely book." "Ingenious....Deserves to be read by every woman (and, for that matter, every man)." "Gripping and disturbing, it pushes the reader -- even the confidently feminist reader -- to question the assumptions underlying many of the mechanisms that drive relationships between women and men." "By gleefully replacing the protocols of one gender with another, Alderman has created a thrilling narrative stuffed with provocative scenarios and thought experiments. The Power is a blast." "When we say that The Power is profoundly disturbing and you may well want to argue with it as you read, we mean that in a good way."